You use Ambari Web > Services to monitor and manage selected services running in your Hadoop cluster. 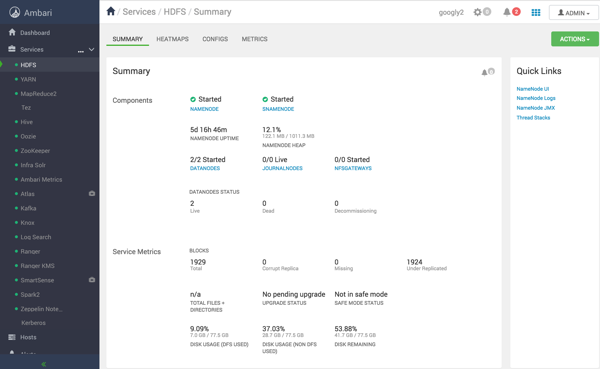 Use Services > Summary to view the status of service components and metrics. Use Services > [SERVICE_NAME] > Summary > Quick Links to find more information for each service. Select Quick Links options to access additional sources of information about a selected service. Use options on Ambari Web > Services > Metrics to manage the metrics visible for a specific service. Use the Widget Browser and the Create Widget wizard to create new widgets that display metrics for a service. Use the Widget Browser or the edit widget icon options to delete service widgets from a service Metircs tab. Use export options on the Metrics widget dashboard to save service metrics data locally. Each user can set a locale in User Settings. Use [SERVICE_NAME] > Metrics to scan metrics data for services that display metrics. Use Service > Actions to manage service operations on your cluster. Use Ambari Web > Services > Start All to start all services at once. Use Ambari Web > Services > Stop All to stop all services at once. Use Add Service to deploy additional services in your cluster without interrupting operations. Use a rolling restart to restart multiple components. You can adjust the default parameter values before starting a rolling restart operation. Use Background Operations to monitor tasks during execution and examime log details, post-completion. Use the Abort Operation option to prevent future operations in a batch from running. Use Cluster Admin > Service Auto Start to control whether components in a stopped state re-start automatically. Disable Auto Start Settings to prevent components in a stopped state in your cluster from re-starting automatically. Use Services > Actions > Delete Service to remove a service from your cluster. Use the Hosts > Actions > [COMPONENT_NAME] > Delete option to delete multiple components in your cluster. Read the audit logs to assess details of Ambari-managed operations and configuration changes. You must manually create an Ooze UI when using the latest versions of Ambari and HDP. Use Ambari Web to refresh the YARN Capacity Scheduler when you add or modify existing queues. As prompted in Ambari Web, restart all required services whenever you update configuration properties.